I recently found a half finished quilt made of fabric squares folding in half to make a triange...batting is put in and then it is sewn on all three sides with a blanket stitch using what appears to be crochet thread. The triangles are then joined together to make a quilt with the same thread. No pattern was with this and I was hoping someone would have one. This was originally done by my mother-in-law who passed 21 years ago and I found it in my sisters attic after she passed this spring so it has become important for me to finish it. Any help would be really appreciated. I also am having trouble finding the crochet thread its thinner then size 3 and I cant find a match. I am going to try emailing or writing thread companies and see what I can come up with. All the fabric was stored in a bag with the half made quilt so I just am looking for the pattern and the thread. just Google or go to YouTube. It's a popcorn quilt. 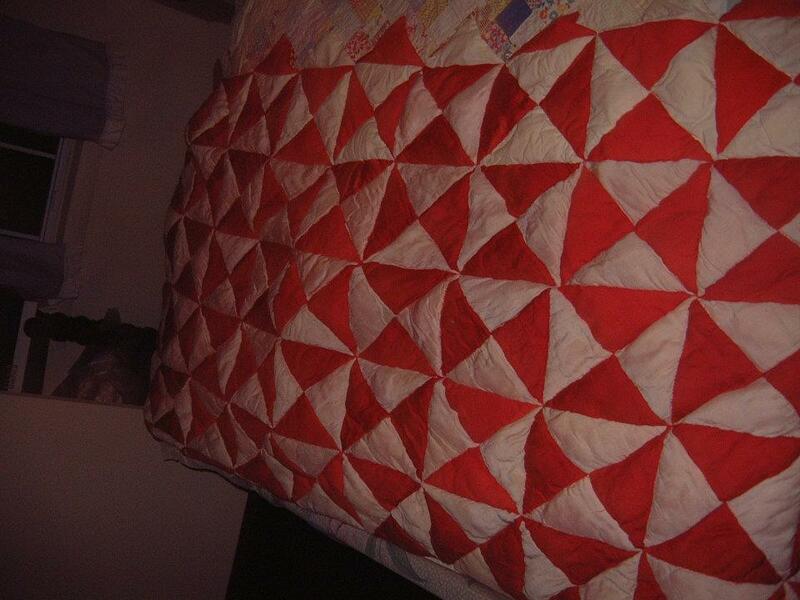 DH's grandmother made one for us in red and white. 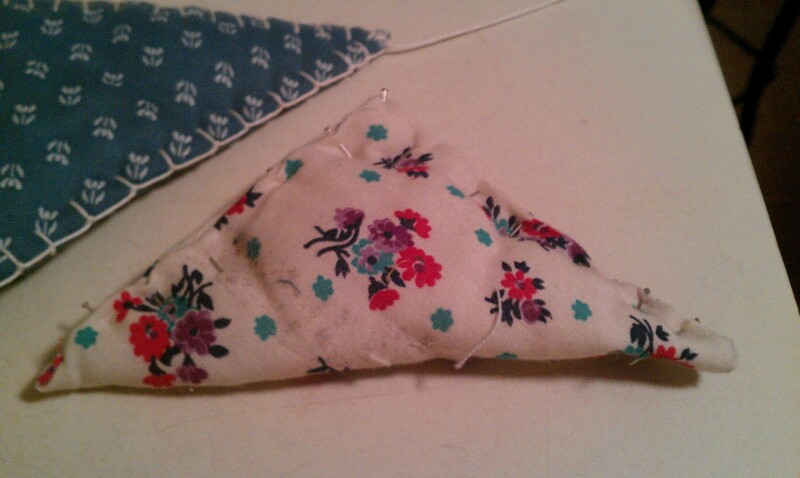 She just sewed the triangles shut then whip-stitched them together. So, the embroidered blanket stitch on yours is a little different. No pattern is needed. I don't think there are any standards. I would just try to match the thread you have as best you can. Is there any discernable pattern in the way the triangles are already stitched together? What/how many colors do you have? Can you post a picture? It kind of sounds like the one where you sew two squares together leaving a small opening for turning right side out where the corners meet in the center? 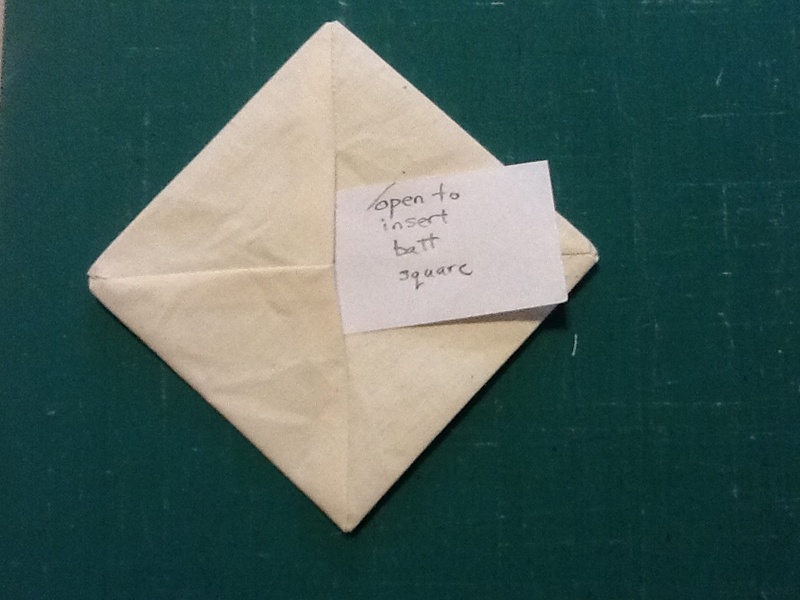 A square of batt is inserted into the hole and then the opening is stitched shut. 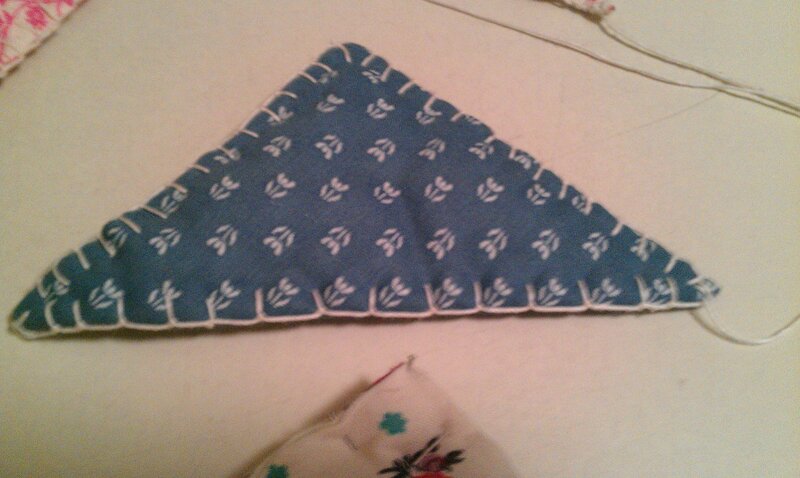 The squares are then hand stitched together and it makes a reversible quilt that appears to be triangles? I have tried to google and found nothing only this book http://www.etsy.com/listing/10523653...roject-pattern. Am I right is this what you are talking about.? Popcorn quilt was all containers and boxes of popcorn or puff quilts. Any chance of a picture I'm English and no idea what it looks like now. Do the squares look like this? This is made from one square of fabric that fold in half, sew across the 2 short ends and then open the rectangle up, matching the center seams and sew part way in towards the center from each corner. 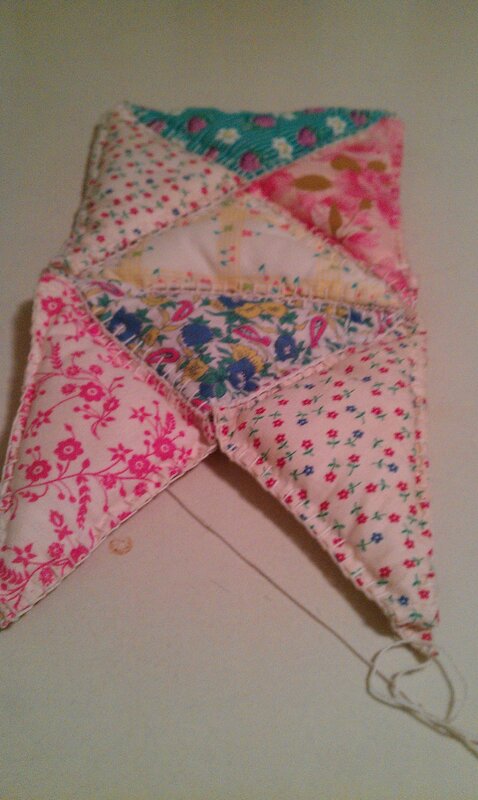 The units are then stuffed with a square of quilt batt and the finished squares are hand stitched together. Last edited by Tartan; 06-24-2013 at 08:59 AM. google Lizbeth Threads. They have thread smaller than 3 in many colors. I can't remember what the website is, but I have purchased from them and it is good quality. Thanks for the picture I have never seen that pattern and method before. sounds like you need Pearle Cotton thread- I have it in many color in size 8 & 12 (I have some 3 & 5 but those are pretty thick) many companies carry it- our local joannes carries some colors. just search embroidery threads. Evening Star Designs, Primitive Gatherings and Sue Spargo all carry it too. Here is a picture...I know a picture is worth a thousand words! Oh wow! I have never seen anything like that before. I have made puffy quilts and wonder if it's the same idea? How are the triangles sewn together? I assume they are whip stitched together. I like it! It is a very portable project - which is really nice. There are long strings attached to the finished triangles which I assume is for attaching them. I was hoping someone would have an idea as to how they are attached. I figure there was a trick. They are whip stitched together thru the blanket stitches - it looks like she did it twice thru every stitch but I can see the pattern or how she did it with those long threads? correction: can't see the pattern! Is it possible they are actually crocheted together?? It sounds like the old fashioned "puff quilts", although instead of squares stuffed with batting, then stitched together, you have triangles. Sorry I can't help, but with so many talented and knowledgeable quilters on this site, I'm sure you'll find your answer. If you have the quilt which sounds super simple, why would you need a pattern? Lay the quilt on a copier----copy 100%. put a craft backing on the paper, cut the pieces apart, transfer to some sort of template stuff then draw a 1/4 inch out from each side, and cut tempates. A lot simpler to do than that, actually, if you have any amount of design know how. Okay, after seeing the pics, it appears each piece started life as a square. Great way to use scraps. This is really cute - it would work great for using up scraps. Could you please post a picture showing the measurements for the triangle sides and then again when they are put into the square? I am assuming you can use any size square you like, but would just like to have a starting point. Thanks!